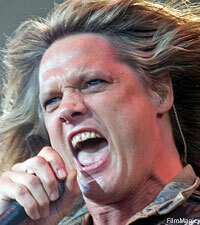 Sebastian Bach has closed a chapter in his rock career. In a lengthy Facebook post on March 14, the former Skid Row frontman wrote in part that the previous night's concert in Sao Paulo opening for Guns N' Roses in front of 60,000 people was "one of the biggest, most important shows of my whole 25-year career so far." He continued, "I have played to [slightly] more people a couple of times, but never had a crowd response as vociferous, passionate [and] heartfelt as the concert last night. It was a very very important night for me, for one heavy reason -- Sao Paulo, Brazil was the very last concert the original Skid Row ever played. Fact is, Sao Paulo is the city where I have played my worst ever show ... 14 years later, last nite [sic], quite possibly my best ever show." He went on to explain that the last Skid Row show was in 1996, alongside Mercyful Fate, Biohazard, Motörhead and Iron Maiden. "Needless to say, it was not the bill for us [and] the crowd let us know it," he recalled. "For those of you out there clinging to nostalgia, asking me ' when is the old band getting back together' ad nauseum, I'm telling you, that ain't gonna happen. Last night's show was the culmination of 14 years of me being a solo artist ... trying to establish my band in its own right. Last night's show really showed us that our band, plainly put, f---ing rules. To play the same city where the old band died & the new band took over is all I need. The fact is my new band plays better."